The Palais Des Papes is an impressive historic church that is a popular tourist attraction in Avignon, France in Europe. This impressive church known as the Palais des Papes has been built since 1335 and was constructed in less than twenty years by two pope builders. Nine popes lived at the Palais des Papes during the fourteenth century when it was extremely unsafe to stay in Rome. 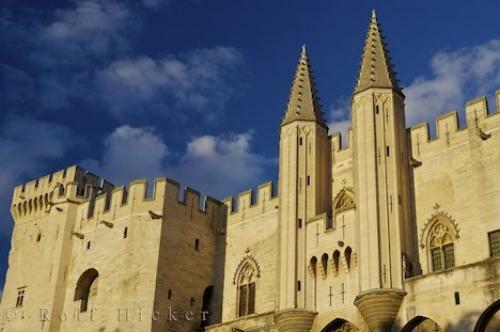 The popes that resided at the Palais des Papes in Avignon lived very lavishly as if they were royalty and ate feasts that would accommodate hundreds of people. The interior of the Palais Des Papes in France, Europe is extraordinary and all the different rooms throughout this church are worth having a look at. The view from the top of the New Palace at Palais Des Papes overlooks the whole city of Avignon where the scenery is outstanding. The Palais Des Papes in Avignon, France in Europe is a extremely popular place for visitors and more than 650,000 visitors pass through these walls each year. Palais des Papes along Place du Palais in the medieval walled city of Avignon, Vaucluse, Provence, France, Europe. Photo of the Palais des Papes in Avignon in the Provence, France in Europe. Pictures from photo gallery "Avignon Pictures"
This picture is part of the photo album "Avignon Pictures" - there are more beautiful images waiting for you.